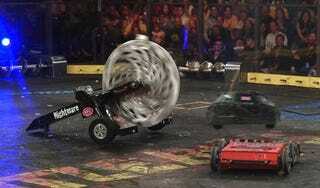 Oh hell yes: BattleBots is coming back to TV. This summer, homemade robots will battle to the death on television, just as Asimov intended. They'll be faster and stronger than ever before. Which makes sense, because the last time BattleBots was on television was over a decade ago. Imagine what they could do now. According to Deadline, ABC will give us six episodes of the show this summer. That might not sound like a lot, but I'm honestly pretty pumped. I didn't have much TV access growing up, but BattleBots was a formative part of my existence anyhow. When I built my own Nerf sentry gun out of Lego Mindstorms, or played my favorite boardgame RoboRally, I was imagining the destructive forces I could unleash if only I had some real robot parts at my disposal. Disney's Big Hero 6 brought all those memories flooding back when I saw it in theaters a few months ago. But those Disney robots weren't real like the BattleBots were. My big question is whether now—over a decade later—the incredible state of modern technology will make BattleBots exciting once more. As Popular Science points out, it got a bit boring when competitors realized that wedge-shaped robots could flip opponents on their backs to win many duels. They couldn't easily right themselves once they were tipped over! But in this, the age of self-driving cars and drone swarms, I can't imagine they'll have trouble finding technology for an amazing new show. Think about it: 3D printers. Open hardware platforms. Maker culture on the rise. I bet you could build a killer robot all on your own.